Using a large skillet or a grill pan, add the olive oil and allow the pan to get hot over medium-heat. Add salt and pepper to each side of the chicken thighs, once the pan has gotten hot, place the chicken thighs and sear on each side for 2 minutes. Preheat oven to 350 degrees. Prepare your bbq sauce by whisk all of the ingredients into a medium-sized bowl, refrigerator until the chicken thighs have finished cooking. Once the oven has finished preheating, place the skillet or the grill pan (only place oven-approved pans in the oven) and bake for 25 minutes. 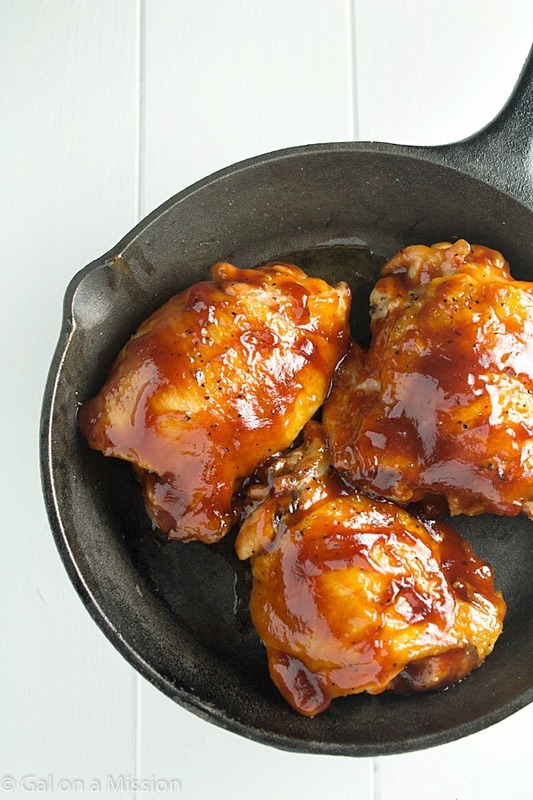 Using a basting brush, add a nice layer of the bbq sauce on top of the chicken thighs. Bake for an additional 5 minutes. Store the leftovers in an airtight container for up to 5 days.